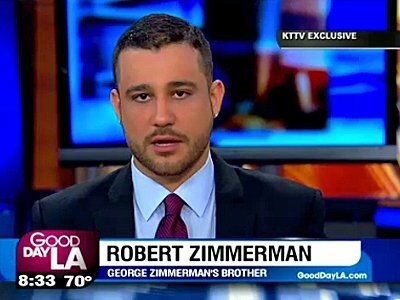 Robert Zimmerman Jr., George Zimmerman’s brother, was not amused by President Barack Obama’s comments on the “not guilty” verdict in his brother’s trial. Robert feels that Obama didn’t learn a thing from the whole ordeal. Zimmerman said he was glad that the President was talking about “encouraging African-American youth,” but wondered why Obama wasn’t encouraging youth of all races. In fact, Robert sounded more statesman-like than Obama ever could. When it came to Obama’s blather of how it may have been different if Trayvon Martin wasn’t black, Robert Zimmerman went more philosophical. “We can have a better country if we all do our part in helping out youth any way that we can,” he said. When asked if he was worried that Obama’s Department of In-Justice was going to go after his brother–who, it should be pointed out has been totally exonerated–Robert said he was worried about the moitvations of the Obama administration. “I’m a little bit concerned sometimes that our leaders are responding to pressure. I think, you know, that clear leadership in terms of respecting the rule of law is something that’s called for now,” he said. Ya think, Robert? The obvious fact is the only reason that Attny Gen. Eric Holder is making noise about indicting George Zimmerman on faux “civil rights” charges is to satisfy racebaiters like Al $harpton and Je$$e Jack$on.